1.Jiang YJ, Yu DQ: The WRKY57 Transcription Factor Affects the Expression of Jasmonate ZIM-Domain Genes Transcriptionally to Compromise Botrytis cinerea Resistance. Plant Physiology 2016, 171(4):2771-2782. 2.Jiang YJ, Qiu YP, Hu YR, Yu DQ: Heterologous Expression of AtWRKY57 Confers Drought Tolerance in Oryza sativa. Front Plant Sci 2016, 7. 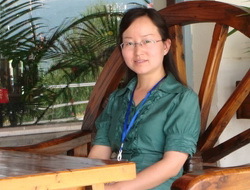 3.Jiang YJ, Yu DQ: WRKY transcription factors: links between phytohormones and plant processes. Science China-Life Sciences 2015, 58(5):501-502. 4.Jiang YJ, Liang G, Yang SZ, Yu DQ: Arabidopsis WRKY57 Functions as a Node of Convergence for Jasmonic Acid- and Auxin-Mediated Signaling in Jasmonic Acid-Induced Leaf Senescence. Plant Cell 2014, 26(1):230-245. 5.Huang W, Fu PL, Jiang YJ, Zhang JL, Zhang SB, Hu H, Cao KF: Differences in the responses of photosystem I and photosystem II of three tree species Cleistanthus sumatranus, Celtis philippensis and Pistacia weinmannifolia exposed to a prolonged drought in a tropical limestone forest. Tree Physiology 2013, 33(2):211-220. 6.Jiang YJ, Liang G, Yu DQ: Activated Expression of WRKY57 Confers Drought Tolerance in Arabidopsis. Molecular Plant 2012, 5(6):1375-1388. 7.Fu PL, Jiang YJ, Wang AY, Brodribb TJ, Zhang JL, Zhu SD, Cao KF: Stem hydraulic traits and leaf water-stress tolerance are co-ordinated with the leaf phenology of angiosperm trees in an Asian tropical dry karst forest. Annals of Botany 2012, 110(1):189-199. 8.Zhou X, Jiang YJ, Yu DQ: WRKY22 transcription factor mediates dark-induced leaf senescence in Arabidopsis. Molecules and Cells 2011, 31(4):303-313.